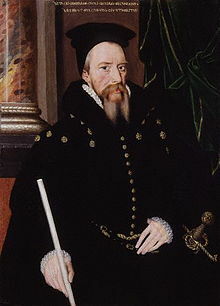 William Cecil, 1st Baron Burghley (13 September 1520 – 4 August 1598) was an English politician, the chief advisor of Queen Elizabeth I for most of her reign (17 November 1558 – 24 March 1603), and Lord High Treasurer from 1572. Famous sayings and their authors: a collection of historical sayings in English, French, German, Greek, Italian, and Latin, by Edward Latham, Sonnenschein, 1906. [Spain seeks to] overthrow the Low Countries, which hitherto have been as a counterscarp to your Majesty's kingdom. Walter Scott (ed. ), A Collection of scarce and valuable tracts: Vol. II (London: 1809), p. 169. The Queen of England has more cause to procure the preservation of the Low Countries in their ancient estate in the obedience of the house of Burgundy than any other place hath...Now if the Low Countries should either be subdued to the Spaniards or possessed by the French, England cannot continue this manner of league. For if the Spaniard shall possess this country by conquest, as otherwise they cannot, then must they also govern it as conquers—that is build in every country and special towns, forts and castles which must be kept and guarded with Spaniards...To maintain these the King must continue great taxes...and there will be no reason to stop him but he will set what tax he listeth upon the commodities of England and so shall England wax poor to make him rich. And then England will have no remedy. Memorandum from approximately the beginning of 1576. Conyers Read, Lord Burghley and Queen Elizabeth (London: Jonathan Cape, 1960), p. 166. I doubt not but the fire illuminating heaven on Michelmas eve was seen there – such as I never saw for the time more fearful. God sendeth us such signs but for our erudition. Letter to Sir Francis Walsingham, c. 1573-76. Conyers Read, Lord Burghley and Queen Elizabeth (London: Jonathan Cape, 1960), p. 155. ...for which I heartily thank you as she serveth me to great purpose. For she maketh my hunting very certain and speedy. She hath never failed me, for almost every day this week but brought me in the right way to a deer. And this last week she brought me to a stag which myself had stricken with my bow, being forced to the soil where, with the help of a greater water spaniel that forced him out of the water, your good brach helped to pluck him down. Letter to the Earl of Leicester on a hunting dog he had given Burghley, c. 1580-81. Conyers Read, Lord Burghley and Queen Elizabeth (London: Jonathan Cape, 1960), p. 257. Upon this I sent to the Register who brought me the [twenty-four] articles, which I have read and find so curiously penned, so full of branches and circumstance, as I think the Inquisitors of Spain use not so many questions to comprehend and to trap their prey. … this kind of proceeding is too much savouring of the Roman inquisition, and is rather a device to seek for offenders than to reform any. Letter to the Archbishop of Canterbury, Whitgift, criticising the Court of High Commission which was persecuting nonconformists (1 July, 1584). Conyers Read, Lord Burghley and Queen Elizabeth (London: Jonathan Cape, 1960), p. 295. Simonds D'Ewes, The Journals of all the Parliaments during the Reign of Queen Elizabeth (1682), p. 350. He [King Philip II of Spain] is the mightiest enemy that England ever had, mightier than his father, the emperor Charles, or any other monarch of Christendom was these many years. … Her Majesty's special and most proper defence must be by ships. For ships of England, her Majesty is of her own proper ships so strong as the enemy shall not be able to land any power where her Majesty's navy shall be near to the enemy's navy. The ships of her subjects are also at this day both in number, in strength, in all captains and mariners, stronger than ever they were in memory of man. Conyers Read, Lord Burghley and Queen Elizabeth (London: Jonathan Cape, 1960), pp. 418-9. Title of a pamphlet published by Burghley on Spanish claims over what happened during the Spanish Armada's attempted invasion of England in 1588. Conyers Read, Lord Burghley and Queen Elizabeth (London: Jonathan Cape, 1960), pp. 433-4. Cecil had been trained as a lawyer, was associated with the Commonwealthmen, and had served as secretary to Lord Chancellor Somerset. He had proved himself an able and industrious administrator and diplomat under Elizabeth's brother and sister. Upon her accession she named him secretary of state and, in 1572, lord treasurer of England. Early in the reign he advocated foreign intervention in support of Protestant causes; but as he grew in age, experience, and responsibility, he became, like the queen herself, more prudent and cautious. From about 1570, he tended to favor diplomacy as less dangerous and more frugal than war. Consequently, he saw the need to work with, or at least avoid offending, the Catholic powers of Spain and France. 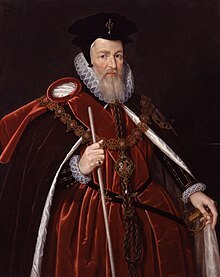 His vast circle tended to attract equally cautious men interested in bureaucratic careers, like Sir Nicholas Bacon (1510-79), Elizabeth's keeper of the Great Seal; Sir Francis Knollys (1511/1512-96), vice-chamberlain, then treasurer of her household; and Thomas Radcliffe, earl of Sussex (1526/7-83), lord president of the North. Where Cecil was sober and careful, [Robert] Dudley was fun and exciting and brought with him a circle of soldiers and poets, including the courtly Sir Christopher Hatton (ca. 1540-91), who served her as lord chancellor and parliamentary "mouthpiece"; and the cunning Sir Francis Walsingham (ca. 1532-90), who, as secretary of state from 1573, oversaw her spies and espionage. These men tended to favor an aggressive foreign policy in support of Protestant causes abroad. Because many of of the men in both Cecil's and Dudley's circles also held local offices ranging from lord lieutenant down to JP, theirs were truly national networks of patronage, Elizabethan counterparts to medieval affinities. Each circle tended to be linked by ties of blood and marriage as well as temperament and religious orientation, and sons succeeded fathers in their service. Usually, these two groups agreed on general aims and they got along well with each other socially. But at times of crisis, they tended to divide. Where Cecil and his allies increasingly urged caution, pacifism, and thrift, Dudley and his followers advocated bold military intervention against what they saw as a growing threat to English interests and the Protestant cause from the Catholic powers. Where Cecil and his circle appealed to the queen's head, Dudley and his group appealed to her heart. The latter attraction produced a crisis almost as soon as the reign began. I give you this charge, that you shall be on my privy council and content yourself to take pains for me and my realm. This judgement I have of you: that you will not be corrupted with any manner of gift, and that you will be faithful to the state, and that, without respect of my private will, you will give me that counsel that you think best. And if you shall know anything necessary to be declared unto me of secrecy, you shall show it to myself only, and assure yourself I will not fail to keep taciturnity therein. And therefore herewith I charge you. Queen Elizabeth I to Cecil, appointing him her personal secretary (20 November, 1558). Sir John Harington, Nugae Antiquae (1769; 1804 edition), Vol 1., pp. 68-9. Letter by Antonio de Guaras to the Duke of Alva (26 March, 1572). Conyers Read, Lord Burghley and Queen Elizabeth (London: Jonathan Cape, 1960), p. 70. Sir William Cecil...was arguably the greatest statesman not only of Tudor England but of sixteenth-century Europe. He was Elizabeth's de facto prime minister for the first forty years of her forty-five year reign. Curtis C. Breight in Arthur Kinney (ed. ), Tudor England: An Encyclopedia (Garland Science, 2000), p. 119. This page was last edited on 30 September 2018, at 17:00.